From the Jar of Souls. The massacre (or "kill streak") is an event in Diablo 3 when a character kills numerous monsters without any large pauses between the deaths. 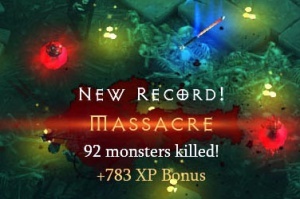 Massacre bonuses award small experience bonuses, but their chief reward is fun and variety. The massacre feature was first shown at the BlizzCon 2008 gameplay demo, where most players were enthusiastic about the new arcade-style feature. In an interview from that time, Jay Wilson said there was a maximum hard cap for the experience bonus, but that it was set it so high he didn't think anyone would ever achieve it. Q: Is there any caps on the Killing Spree combo? Jay Wilson: Yes, there is a maximum combination combo. It’s related to your level but I don’t think anyone can actually get it. It has a theoretical limit, but you are not likely to reach it. In September 2009, Jay Wilson said in a press conference that the idea for Massacre bonuses came about when the team was trying to give the Experience Shrine and Monster Shrine from Diablo II a new twist. There are experience shrines in Diablo 3, though no Monster shrines. A Demon Hunter racks up a 124 massacre during the Jar of Souls quest event. A Demon Hunter scores 368 in The Weeping Hollow. Aftermath of a Jar of Souls massacre. Photo of a monitor showing a Massacre from the Blizzcon 2009 demo. This page was last edited on 24 March 2013, at 14:04.